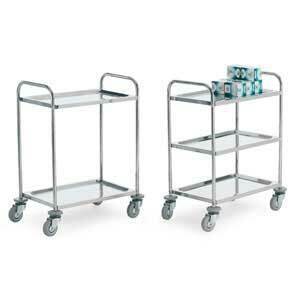 Manufactured from grade 304 Stainless Steel, these trolleys are designed for use where hygiene is important. For a great many companies hygiene is a critical issue and having the correct equipment in the workplace can help them meet the hygiene and cleanliness standards required of them. 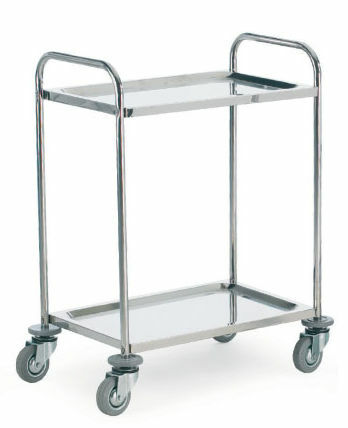 The 304 grade stainless tray trolleys 100kg capacity will help to ensure such companies keep their standards of hygiene as high as possible. The use of stainless steel in products not only makes them robust and long-lasting, it is also of great benefit in terms of hygiene, because it is so easy to keep clean and is remarkably resistant to corrosion. The provision of corner buffers is great for preventing accidents. There are four swivel castors, all of which are non-marking. 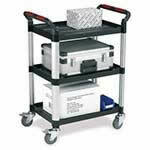 Swivel castors make the trolley easy to move around the workplace, especially in respect of tight areas. At just 8.5kg the trolleys are quite lightweight, while also being robust, with a total load capacity of 100kg. Customers can be certain that when they purchase these stainless steel trolleys they are investing in a quality, robust product that will help them meet workplace hygiene requirements. 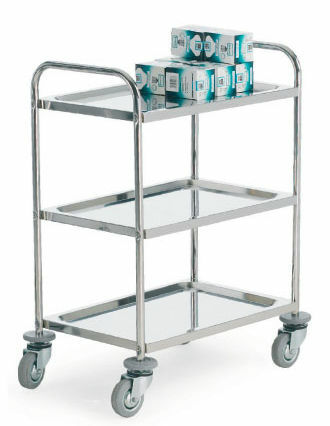 Customer enquiries relating to any of the products in the stainless steel trolley range will be dealt with by a member of the telephone support team.